This mod expands the scale and realism of world generation and makes it so that you can explore without seeing the exact same biomes over and over. This mod does not add any new blocks or items. Vanilla clients can connect to servers running this mod. There are 8 geofactors that contribute to the terrain generation and features. Each has a value from very low to very high. The biomes, features, and conditions around you can give you clues to the values of the geofactors. Each ore has required conditions and bonus conditions. You should be able to find some ore if just the required conditions are met, but you could find significantly more ore if the bonus conditions are met. Required conditions: Stone base rock and thick topsoil layer. Bonus conditions: Wet climate and bowl-like depressions in the ground. Required conditions: Stone base rock and hilly or mountainous. Bonus conditions: Smooth land with no visible erosion and with lava lakes or obsidian on the surface. Required conditions: Granite base rock and deep eroded canyons. Bonus conditions: Cold climate and hilly or mountainous. Notes: Look for the stone strata layer in the granite base rock. Required conditions: Granite base rock and hilly or mountainous. Bonus conditions: Dry climate and very thin topsoil layer. Required conditions: Granite base rock. Note: Look for the andesite strata layer in the granite base rock. Required conditions: Granite or diorite base rock. Note: Look for the andesite strata layer. Emeralds are sparse. Required conditions: Diorite base rock and smooth land that is far from any visible erosion. Bonus conditions: Very thin topsoil layer and no lava lakes or surface obsidian. Notes: Look for the granite strata layer of the diorite base rock. Required conditions: Diorite base rock and lava lakes (possibly surface obsidian). Notes: Diamonds are deeper underground and uniformly spread out. Required conditions: Deep eroded canyons, no lava lakes, and thick topsoil layer. Required conditions: Sandstone base rock and wet climate. Bonus conditions: Bowl-like depressions in the ground (may be filled with water) and very thin topsoil layer. Notes: Look for white terracotta strata layer in sandstone base rock. Required conditions: Sandstone base rock, very dry climate, and very thick topsoil layer. Bonus conditions: Dry climate and no lava lakes or surface obsidian. Required conditions: Granite base rock and wet climate. Bonus conditions: Deep eroded canyons and lava lakes or surface obsidian. Required conditions: Sandstone base rock and very hot climate. Bonus conditions: Smooth land with no visible erosion and thick topsoil layer. Required conditions: Diorite base rock and lava lakes. Bonus conditions: Deep eroded canyons and thin topsoil layer. Required conditions: Stone base rock and cold climate. Bonus conditions: Deep eroded canyons and hilly or mountainous. Notes: Look for the andesite strata layer in the stone base rock. Required conditions: Sandstone base rock and flat plains or bowl-like depressions in the ground. Bonus conditions: Wet climate and no lava lakes or surface obsidian. Required conditions: Stone base rock and very thin topsoil layer. Notes: Uranium is very sparse. As erosion increases, the frequency and size of caves increases. Surface entrances are almost non-existent, sometimes they can be found underwater in eroded areas. Caves do not usually extend up into the topsoil layer so you have to dig down into the rock below the soil. Abandoned mineshafts are fairly common. Look for fairly straight fault lines running across the terrain and sometimes across water. These fault lines will be one block higher on one side. Go in the direction that the blocks step down to eventually find ocean. Keep looking for more fault lines on your way to ensure you are continuing in the right direction. Go in the opposite direction to go to higher elevations. 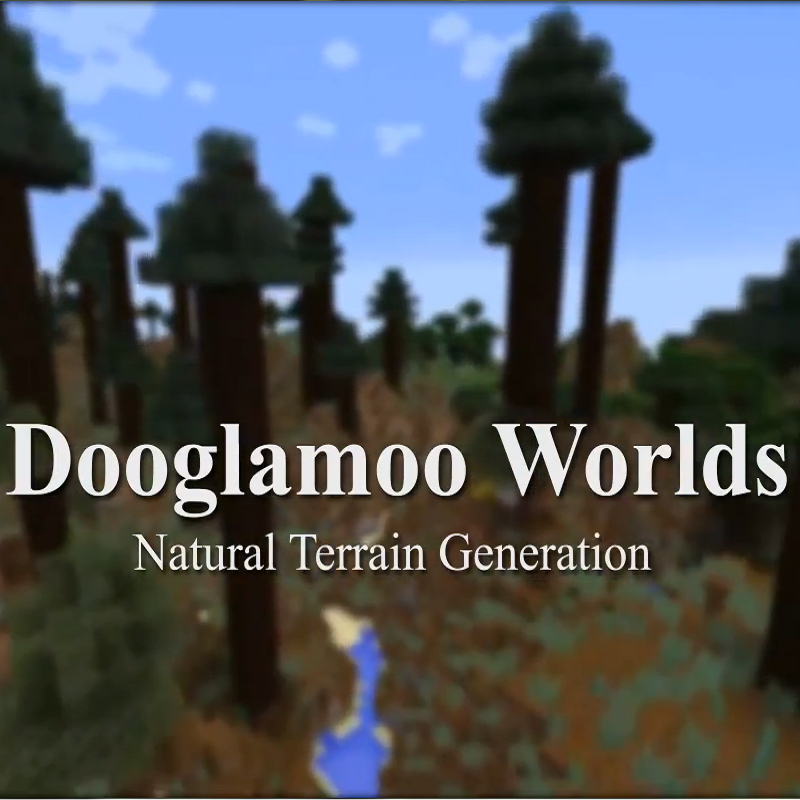 Dooglamoo: Default Dooglamoo terrain generation. Fairly even distribution of geofactor values. Dooglamoo Sm: (Small) Geofactors change more quickly, meaning you don't have to travel as far to get more condition changes. Dooglamoo Wt: (Weighted) Random weights (+/-) are added to the geofactors for the world. This means you could get a world that is slightly to extremely more mountainous, wet, volcanic, etc. Dooglamoo SmWt: (Small Weighted) A combination of small and weighted. For compatibility with Biomes O Plenty, you need the config files which you can get here. Beautiful! What an amazing atmosphere. This is one of the best mods I've seen. Some aspects take some getting used to (I'm so used to vanilla ore generation, and I love what this mod does but it is an adjustment! ), but it's just incredible. I don't know if I can go back to vanilla (or any other world gen mod) now that I've seen this. My desktop background is of the Mongolian steppe in the foreground rising gently up to snowy mountain peaks behind, and this mod creates just that kind of beautiful, natural aesthetic. It should be more popular than it is. You need millions of downloads! Thank you so much for this! My Minecraft closed without a report when i loading a new world. Hello, thank you for making this mod as it is absolutely incredible. I love how it feels like Realistic Terrain Generation from 1.10 as I miss that mod. I love the cave generation as well, the large open caverns are very fun to play around in. However, they are not quite suited for what I am looking for for a private modpack I'm working on. From what I can tell, there is no way to disable the cave generation supplied by the mod and replace it with vanilla generation or that of another mod such as Worley's Caves. This option would be helpful for niche situations and could only be there for a few people who may want to disable it. The generation could maybe happen regardless of the erosion geofactor, or only if the region has a high enough erosion geofactor, which could be set in the config files. This could allow for more configuration when it comes to cave generation, as awesome as huge caverns are, they are very sparse and make underground exploration nonexistent. This would be an awesome change. Thanks! Dooglamoo, I don't know what are your plans, but if you are not going to update and fix this mod, would you be okay with someone else continuing it? I'm not talking about me, as I am not a modder. I love your mod and actually think is the best terrain generator in mc and I would be very sad if i weren't able to play it on latest versions of mc and customize it. There are still some issues that could be mainly fixed with customizarion options, like tree generation if you use dynamic trees and ore gen customization. that changes ores (iron, Redstone, etc) and changes their generation. Then in your fashion they are almost everywhere. Are there plans to update the mod? Yet another dead world gen mod. Any plans for future updates? Hi, me again. I've been using this in a modpack, and a month ago it was working fine. Recently after some updates, my game has started to crash with this error. I noticed mention of a wasteland. Could this be BoP related? I'm using the configs from here https://minecraft.curseforge.com/projects/dooglamoo-worlds-biomes-o-plenty . How do I do so that the biomes do not repeat themselves but leave one after the other? Are there any plans for a more in-depth config file? I miss having dense forests. Will this mod work with your cites mod? Can you generate the abandoned cities in the new world types? Hiya. Someone else asked this already sorta, but didn't get an answer. Are Tech Reborn and Immersive Engineering the only mods that Dooglamoo Worlds can spawn ore for? Or more specifically, are the above listed ores the only ores Dooglamoo Worlds will spawn? Also, is there any way I can disable or replace the layers of cobblestone found underground? They kinda stick out to me, as I'm used to seeing cobblestone as being player-made only. I play Dooglamoo Worlds with the Base Metals mod, and I can say from experience that ore from other mods will generate. It adds a prospecting pick to the game which makes exploring the world and finding resources much easier with the sparse layout added by this mod. Hello, I apologize if this has been answered before, but I cannot find it. I would like to use this mod in combination with Better With Mods. Is there any way to completely disable the "density" geofactor to enable BWM's 3 stone strata layers to generate everywhere instead? I haven't actually tried this with BWM, but from what I know about terrain generation in this mod, this sounds like something that wouldn't work together right now, sorry. I love this mod! It looks great with the UNITY texturepack, and I'm doing a Botania playthrough with it installed right now. I appreciate that the tulips are color coded for temperature. Its also nice having forests that are large in area, but sparse enough to walk through without constantly breaking leaves. The roofed forests in particular look great. My biggest gripe is that I cannot find any clay or sugar cane! I'm trying to fix this with CoFH:World, and will post a working json when I figure it out. Botania flowers don't seem to spawn either, but that isn't necessarily a bad thing.